This past Spring Break I got to finally have a self-care moment in Miami with my daughter as we took our first ever spring break together and take more pictures there, but also I needed some inspiration and Miami is full of colors – everything including the street murals, Art Deco architecture, gorgeous beaches, foodie scene, and vibrant culture. 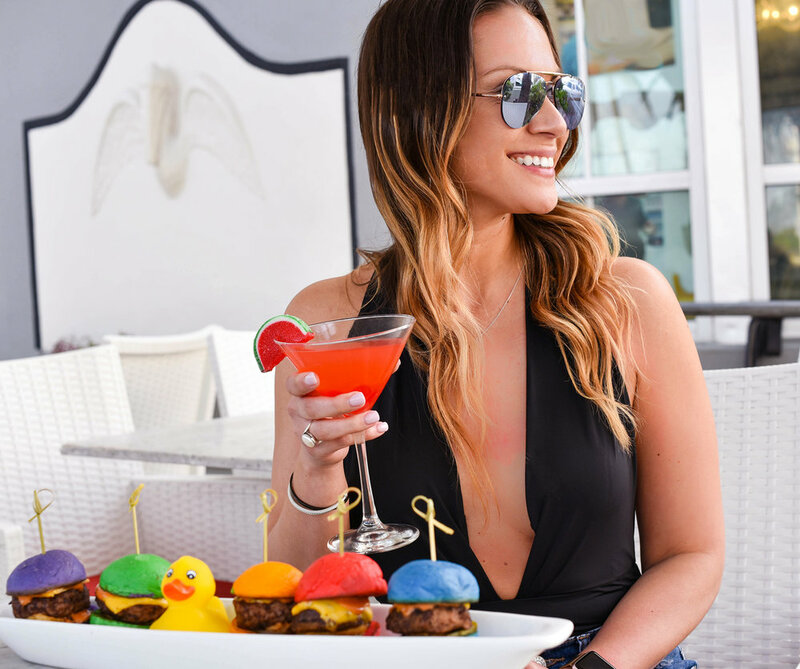 And while the nightlife is what most people buzz about, the daytime offers plenty of opportunities to soak in some of Miami's year-round sunshine and recharge the mind and body. I've found some well-known locations as well as some hidden gems that you might want to take check out. Whether you're hoping to get a picture for your Instagram or want to visit some cool spots that you knew didn’t exist in Miami, this list should help explore more of Miami! This was my daughter’s and I absolute favorite spot to grab dinner for two nights. Tucked away on a palm tree-lined pedestrian street with string lights twinkling overhead, Española Way is a charming Old World throwback in the heart of South Beach. There are restaurants on both sides of the streets with everyone offering great “Happy Hour” specials between the hours of 4-7pm. Hosteria Romana was the first place we ate for dinner, which has fantastic Italian food that we split between each other. From the moment we arrive hostess stand to our waiter, we were treated top-notched. And we loved the music they play while we ate. I HIGHLY RECOMMEND eating here. The last night we were there, we ate opted for traditional Cuban food, so we ate at Havana 1957. It sets itself apart by creating a unique dining experience that allows you to spend Un Dia En La Habana and relive the glory and glamour of old Cuba during the 1950s. It was so yummy! Dreamer Acai Juice Matcha is a Juice Bar in Miami Beach, FL Can we say this the perfect Instagram spot! I had to write a full blog recap of this spot, but it is a must visit, and their juices are rather tasty. Located in Downtown Miami's Museum Park, Frost Science is a world-class science museum dedicated to sharing the power of science, sparkling wonder and investigation, and fueling innovation for the future. If you’re looking for a fun day with the family that all will enjoy this is the place! They have fun, interactive exhibits that the children will love. The aquarium spans three floors, and you can even touch stingrays on the top level. Not to mention the incredible view of Miami you can see from the observation deck! Even Miami's beaches have their artistic flair — bright lifeguard towers provide colorful accents on the sands of South Beach that provide great photo ops. If you want crazy, elaborate drinks and food come here. It's excellent for an Instagram pic. I enjoyed my visit to the sugar factory on Miami Beach! Now I will say the prices are a little steep, but the experience to me makes up for that part. I mean some of those extravagant drinks and colorful dishes, how do you pass that up?! I mean they have Rainbow Sliders people! Miami’s streets are full of creativity, but the best street art can are found at Wynwood Walls, an outdoor gallery of huge murals by street artists from all over the globe. Go early to avoid the crowds, and take a scenic stroll immersed in world-class art. Afterward, wander around the neighborhood, which is filled with great restaurants, cafes, and shops. Wandering around the Wynwood neighbor’s we stumbled across this cute little pie shop. I emphasize the word “LITTLE.” The menu will include a dozen permanent and rotating bit-sized flavors, some filled with Oreo and Nutella, guava and cheese, key lime, or salted caramel and others topped with onion and duck confit. “Customers can enjoy a whole pie experience without committing to one single large flavor or merely a slice,” cofounder Paloma Machado-McGowan says. I got the key lime pie, while my daughter went for the S’mores. Both delicious. The last day we checked out our hotel, and I decided to book a last minute spa day at the gorgeous Mondrian Hotel. GUYandGIRL Spa is the best place to pamper yourself and unwind. First, the hotel itself is beautiful, clean and you already know I love black/white aesthetics. A great PERK is if you book a treatment, you are welcome to spend the entire day at their award-winning pool with full chairs and beach towels, which my daughter and I took full advantage.